I've been a fan of Gwen Stefani's fashion style for a long time now. I loved the way she'd mix vintage looks with a edgy-rock/hip hop/LA style. With her fashion line L.A.M.B, you can see some of her signature styles in the clothes she sells. 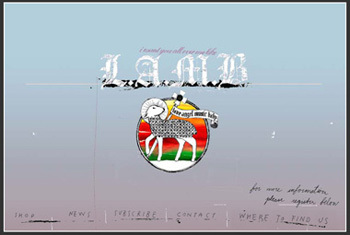 The L.A.M.B. 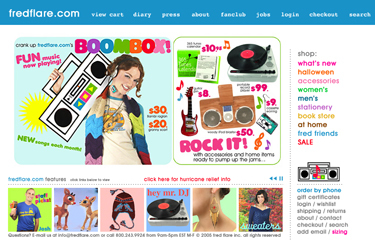 site is great and is good for background info, but the online store's selection is quite limited. 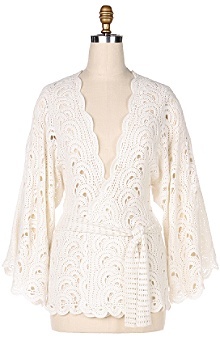 I found a wider variety and better photographs on ShopBop. Here are two items that really called to me. I love the pleated blazer in tweed with a 1/2" ruffle trim at the edges. Very stylish and feminine. I also like the new shapes in sweaters with this plaid sash turtleneck in cashmere. You can really see the influence Vivian Westwood had on Gwen. I think I have a major handbag problem. No matter what I tell myself, for instance: "I'll splurge and get the luxe expensive bag because it will last me a lifetime and I won't buy another bag for a loooong time." Yeah right. Because in reality, the other scenario is: "This is so dirt cheap I have to get it and also in another color." I just keep multiplying the amount of handbags I have on my closet shelf. I even got one of those racks at Bed and Bath that let you stack things better. It just doesn't stop. This constant need. The constant addiction. I figure that by the time I'm 80, I'll be living in a house full of handbags. Everything was fine until I saw THIS. 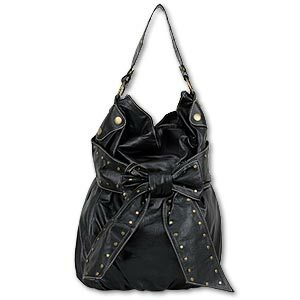 I found this cute studded bow slouch bag and well pretty much fell in love with it. Its trendy enough to be cool and cheap enough (45 bucks) for me to justify the purchase. And part of the justification is that all these celeb girls are buying bags from this LA boutique, Intuition. There's even a picture of Amy Smart with this bag. Oh sweet Jesus, I'm turning into an US Magazine cliche!!!!! 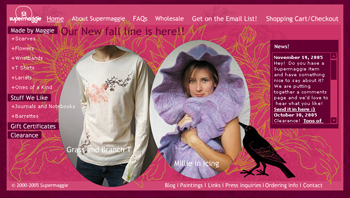 The Supermaggie site is a great place for some beautiful accessories. The handmade goods are like no other I promise you. From T-shirts, flower pins, wristbands and jewelry, you'll definitely stand out from the masses. 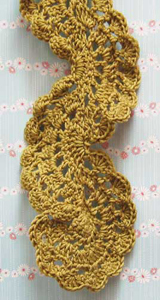 I love this wrap and the many different ways you can wear it. It's so delicate and feminine. 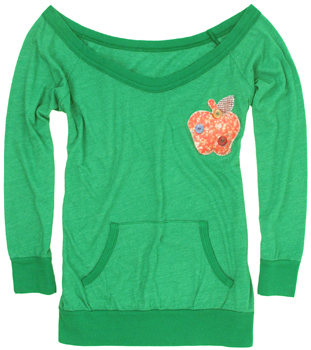 The crafty apple jersey tee ($36) is perfect for a sporty n' stylish look. i like the kangaroo pockets in front. 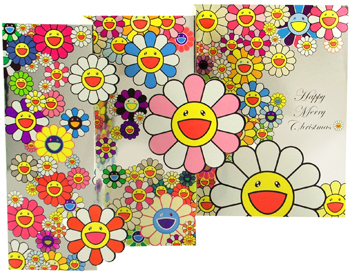 I love these Murakami holiday cards ($15.95) with the happy flowers. The designs are way better without the Louis Vuitton in the way. The Jack and Lulu pink and chocolate cupcake cards ($10) are great for sending quick delicious notes. 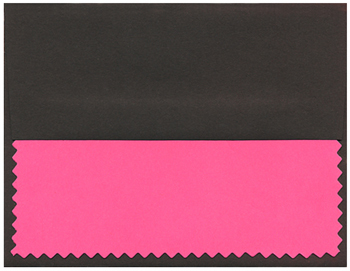 I love the pinking sheared edges. And this one was the cutest/most hilarious item I saw. Of course it's from Japan. 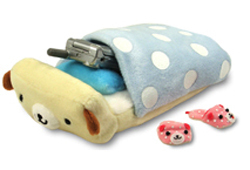 A plush cell phone bed ($22) where you can charge your cellphone at night. It comes with 2 super cute pink slippers that double as screen cleaners. Its nice to know that its not all just pretty pictures with the new Nokia L'Amour cell phones. I've gotten some great feedback from all of you on how much you love this phone from the posting last week. Now, T3 a UK based gadget magazine, has a great hands-on review with lots of photos. 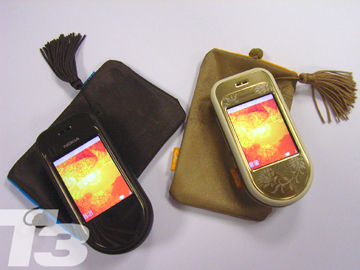 I love the added surprise of the satin pouches with tassels that hold the phone like its own little special bag. (See I wasn't too far off with the Gatsby story.) The interface of the phone when turned on is so strikingly beautiful its hard to believe that interface design on most cell phones these days seem to be an afterthought (think Blackberry 7100 series and those childish clip art icons). Key quote of the review: "Elaborately patterned mirror surfaces, faux leather trim and mock wood finishes are the obvious standout features. But as horrid as these might sound, somehow Nokia has pulled it off, blending these materials with bizarrely elegant expertise." Oh la la! Hurry up and get this phone out to the States! If only luxury wasn't so expensive. This one is just pure beauty. One of my inspirations for the season. 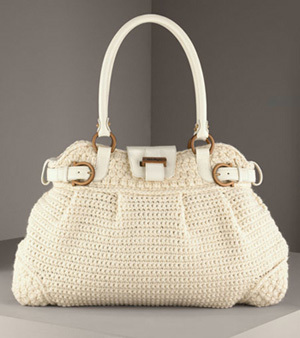 If you can afford it, its just $1,390. The new Stella McCartney H&M collect drops into stores on Nov 9th. I for one will have to wait 10 days later until the SF store opens on November 19th. (Thanks Leigh for the scoop!) So far on the H&M site, they've thrown us a little teaser. The Stella McCartney preview is up with a few photos from the collection. The full collection will be online next week on October 27th. For now, I want the denim pants and the vintage 30's inspired green chiffon dress. I'm guessing the reason why the clothes are on headless mannequins is because kate moss got pulled from the campaign. Too bad. I would have loved to see her in these outfits, especially the chiffon dress. Maggie Rizer would have been a great alternate. There's nothing more stylish these days than a clutch but sometimes they can be hard to get a handle on. With Arza Design's sleek minimalist look, each wallet and bag hangs nicely around your wrist, just like a bracelet. 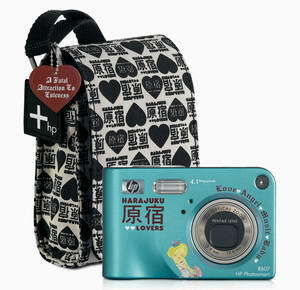 I like the bracelet wallet and bracelet bag pictured here. Just perfect to tote around town or for a sizzlin' night out. Arza's goods can be found at these following stores around the US. Well it seems Nokia is definitely on a roll here to get some feminine beauty into technology. I love this next step they took with delicate vintage style. The other 2 phones in the collection are the Nokia 7360 a candy bar style phone, and Nokia 7380, the thin sleek silver lipstick phone. These phones should be available in Q1 of 2006. For more technical information on the phones, visit Phone Scoop and Engadget. 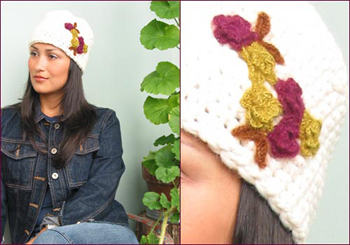 Get yourself ready for fall and winter with girl 32's cool knit accessories. The things these ladies make are not only beautiful but utilitarian as well. 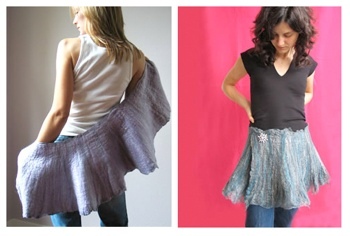 The scarf is complete with a pocket so you can put things like money, your cell phone, or an iPod inside without having to rummage through your bulky coat or purse to find. Hellooooo! What a great idea for even just a quick walk over to the corner store to get some food. 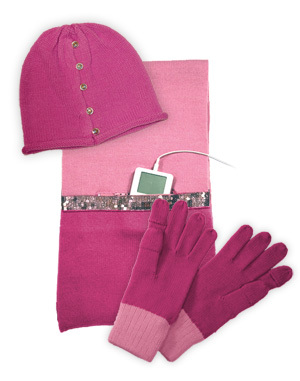 The knit hats have buttons so you can actually wear your hair in a ponytail and the the gloves have hooded fingertips on the thumb and forefinger so you can keep your hand warm while you need to make a call on your cell. You can buy each of the items separately or get The Smart Set and a save $ while purchasing all three items!